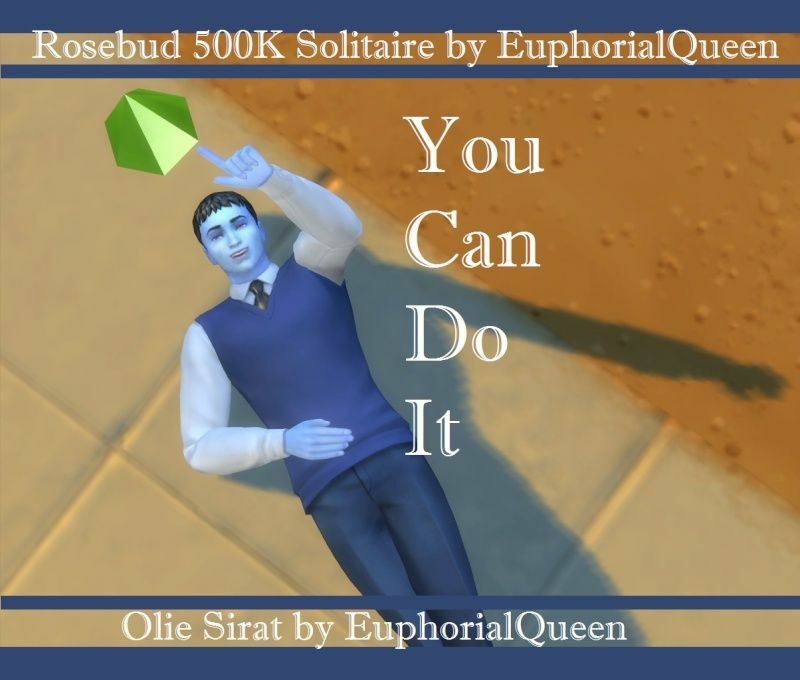 Rosebud is an in-game Achievement that requires the household to have a total household Net worth of One Million Simoleons. That is Simoleons on hand plus the value of the lot and furnishings. This can be tracked using the Wealth & Collecting tab on the Accomplishments menu. The test run in my game has been completed successfully. There will be one Sim only to reach the challenge goal. 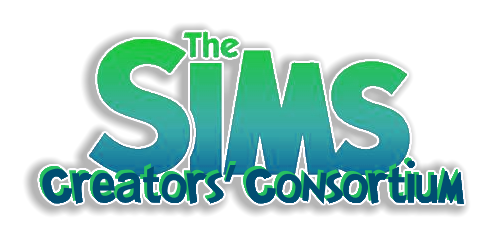 The goal for a single Sim will be to reach a Net Worth of 500,000 Simoleons. Fresh Sim from CAS with any traits. If you wish to share you can use either of these hashtags. This is the only Sim allowed in the household during the entire challenge until goal met. If using a Male Sim he may Try for Baby but neither the Child nor the Mother can join the household. *Aging is ON* Normal Lifespan. This will keep the population fresh with new Sims added to replace Elder / Dead Sims. Cheats are not allowed except as noted to reduce funds. Exceptions: Once Sim is on empty lot use testingcheats on followed by Money 00000 to reduce to Zero Simoleons. Glitches may require a cheat to resolve. 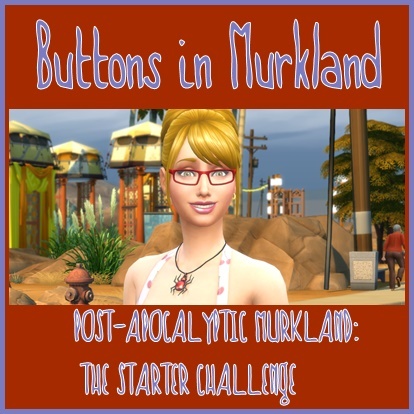 Additional guidelines: Must earn 500 Simoleons by collecting or creating before getting a job. Purchases can be made only once per week. I chose Bill Day (Usually Monday) after the bills are paid. You have 24 hours from when the bills arrive to purchase items or remodel the lot. That includes any build / buy purchases. Did you forget to buy something? It will have to wait until the next week. Exceptions: Books, Repair Parts or Seeds which are bought via computer, bookcase or planter box. Exception: You may buy an item to mark the day you use a Youth Potion. This is an unpredictable date so is an exception to the purchasing restrictions. Aspirations are not set in stone. A lot of Satisfaction Points are going to be needed for a steady supply of Youth Potion. So how do you survive long enough to reach 500K Simoleons? Youth Potions and lots of them. They must be bought from earned Satisfaction Points. Keeping track: I use the Wealth & Collecting tab on the Accomplishments menu to track net wort. Time: Each week when bills arrive I buy a small decor item (same one for each week) and place it in a designated area on the lot. Potions: A chose a different small decor item to represent each time a Youth Potion was used. Travel and Businesses: Your Sim is allowed to travel anywhere in the game without restriction. The Get To Work EP will be out soon. A business can be owned and run by your single Sim. Employees may be hired to help with the business as long as they are not Members of the household. You are allowed to stay on the business lot as long as necessary. Additional guidelines for this EP gameplay will be added once it is officially released. Feel free to add comments or ask questions. Exception: Alien abductions that result in pregnancy Will be an exception to the Single Sim/No children rule. The child may stay in the household. Start with either one cat or one dog with your single Sim. Must have the appropriate items to keep your pet happy. Food dish, pet toy and small bed (cat must have a litter box). IF you start with a pet you can purchase the necessary supplies. You may fill the pet dish once before reducing funds to Zero. *Remember §§ are required to feed your pet or to give them treats. Start as usual with a single Sim and Zero §§ on an empty lot with only a mailbox and trashcan. You must earn enough §§ to buy pet supplies before adopting a stray. Tents, coolers and campfires are very helpful during the first stage of this challenge. If you have the Seasons EP the tents do provide some protection from the elements. You do not have to do the Leader of the Pack aspiration to benefit from having a club. The club system can be used for skill boosts. Only two people are required to have a club. Create your own club so you can control activities. Social interactions are good as well as things like fishing, searching for frogs (you only have to view them) or playing an instrument. I do not recommend gardening as a club activity. Club members will tend gardens but will also harvest. All your crops will be gone with nothing to show for your hard work. The yard sale and wall gallery items are useful for selling items for up to 300% mark-up. Unfortunately the wall gallery is not working at the moment. The SimGurus are aware and hopefully it will be fixed soon. You must have the appropriate items to keep your pet happy. Start as usual with a single Sim and Zero §§ with the required items. Changing to Cat Hangout / Dog Hangout lot traits will bring strays to your lot. No need to travel to find them to adopt. Going on vacation to the Jungle will be allowed any time you wish. *Money must be earned to pay for lodging and supplies. *Recommended skills - Charisma, Fitness, Gardening, Handiness and Logic. The higher the skill levels the better chance for success. Selling relics can be quite lucrative with very quick financial gains. Using the City Living -or- Jungle Adventure Yard Sale Table is allowed with any rate of Mark-up. Weather patterns in each world will vary. Tents do provide shelter but things previous left outdoors may have to be inside. A simple roof (even without walls) will provide some shelter. Get an umbrella (via the umbrella stand under miscellaneous appliances) for rainy weather. Build up handy skills to upgrade the machine to control the weather. Beware this can also backfire and your Sim could get toasty. Use the calendar for custom holidays that are useful for your Sim. Include a visit from Father Winter or the Flower Bunny for special gifts. Plants are all seasonal and except for year-round crops have a limited time to harvest. A Money Tree can be purchased with 5000 satisfaction points. I planted a money tree at the very end of stage one of this challenge. It takes several days to actually start growing. The first yield was about a week or so after planting. Use features that fit your play style. I've started a thread of my attempt here. Question: I've been doing the woodworking. If my sim makes an item does she have to wait until each Monday to pull it out of buy/build to use it on her lot or sell it? No you do not have to wait for handcrafted items. Only build / buy items in the catalog. So if an object breaks, like a stereo, then it's either repair, salvage for parts or wait until Monday to replace the item? I figured you'd say that ....EVIL! Has anyone ever had any trouble with not being able to sell from their inventories? I was dragging to my sell space and the cursor glitched up and I couldn't drag and sell anything. I had her travel, shower, etc., finally I quit and restarted. All was well with the inventory when I went back in. This was a Sunday. By Monday night (7ish) the bills still hadn't come so I saved and quit. Did a game repair and the bills were there when I reopened the save. I have not had any problems like that before BG. This challenge idea has been eating away at me. And I think I've lurked long enough. I'm going to try this for myself. Here I go! Wish me success. I started a thread HERE. Hope you like. This challenge sounds like a lot of fun very interesting and a..............challenge! Must wait to start it, when I feel better. Thanks! I'm having so much fun with this. I hope you feel better soon. You'll love this challenge. And its no fun feeling bad. I chose to use just before Adult birthday. That keeps Sim as YA. I can't buy anything until the bills come due but can I sell things as I go? I think I know the answer. Just want to be sure. Sell to your hearts content any time you wish.